Try comfortable colored contact lenses for astigmatism using Freshlook Colorblends Toric contacts. If you suffer from astigmatism and have a complicated prescription, you may have found it difficult to get hold of colored toric contact lenses. But you'll be pleased to know that the Freshlook brand caters for patients with astigmatism and offers several different color options to try in the Freshlook Colorblends Toric range. Freshlook Colorblends Toric is available for patients with astigmatism in 4 different colors - blue, gray, green and honey. There are many more colors available in the standard Freshlook Colorblends range which come in 12 different shades. Freshlook Colorblends are supposed to be suitable for either pale or dark eyes as they change your natural eye color; the Freshlook Dimensions range enhances eye color but is not available in Toric form as yet. They are a soft disposable lens designed to be worn for a maximum of 2 weeks then replaced with a new lens. It is worth reading online reviews, however, as some users say that you can't really notice the difference in color, depending on the natural color of your eyes. Colorblends 3-in-1 technology blends 3 different shades to give a more natural look and the Toric option comes in 3 different cylinders (-0.75, -1.25 and -1.75) with a diameter of 14.5 and a Median base curve. If you have a complex prescription, you may not be able to find the right colored contact lenses for astigmatism in the Freshlook Colorblends range, but they are the only disposable toric colored lens available in the market at the moment. 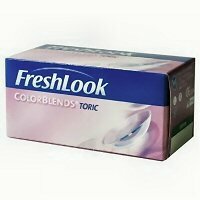 If you're not sure what colored toric contact lenses to choose from the Freshlook Colorblends Toric range, you can go to the Ciba Vision Freshlook website to try on colors by uploading a picture of yourself and playing around with the different contact lens shades to see what suits you best. Tip: You will never get a true indication of the color effect on your own eyes, but it will help to narrow your choice. Plus at just over $8 per lens, you can probably afford to experiment a little.